"The way that violins are made today are very different than when the instruments were made in the Baroque period (1600-1750 or so), but only a few of the differences can be seen right away. One of the first things that most people notice is that a baroque violin has no chinrest. Invented around 1810, the chinrest is a wooden device much like a shallow cup or bowl that allows a modern violinist to support the violin with the chin and shoulder. The baroque violin is held differently – with the left hand and the collarbone – so no chinrest is needed. Another thing many people notice is that the fingerboard (the piece of wood which runs under the strings) is shorter on a baroque violin than on a modern violin. You can see these differences clearly on the violins below, the baroque violin is on the left and the modern one on the right. "If you were looking at these instruments in person, you might also notice that the strings are different: three of the four strings on the baroque violin are plain sheep’s gut and the G string (the lowest one) is made of silver wire wound around a core of sheep’s gut. On the modern violin, the lower three strings are made of metal wire wound around cores of either gut or an artificial material and the highest string is a plain strand of steel wire. The high E string also has a special fine-tuning device visible on the tailpiece (the piece of wood near the chinrest to which the strings are attached). "More difficult to notice (but very significant) is the differences in the necks of the violins. On a baroque violin, the neck is attached to the body in the same plane as the body, and the fingerboard sits on a wedge of wood on top of the neck. On a modern violin, the neck is tipped back at an angle to the body, and the fingerboard is attached directly to the neck. You can see this below. These are just a few differences in construction that give the baroque violin a warmer, richer sound than its bright-sounding grandchild." 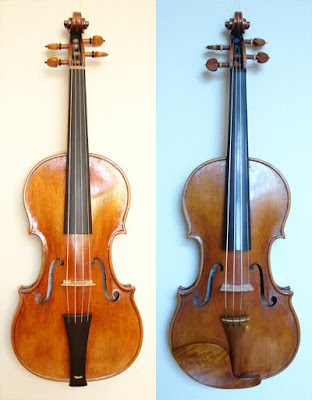 In case you you were curious, Timothy G. Johnson built both of the above violins during the same time period from many of the same materials (note the similarities of the wood used for the body). We thank him for the use of these photos. The baroque violin belongs to the author and is a Stradivari model. It actually has two siblings in the PBO family – a violin played by Maxine Nemerovski and a cello played by David Goldblatt. Learn more about our October set: "The Concerto – An Adversarial Friendship." Beer and Baroque a success!